Dimensions 844'10" by 85'4" by 29'1"
Underwater protection designed against 440 lbs (200 kg) of TNT consisting of 2.2m (7'3") void, oil tank, 1.2" (30mm) Ducol torpedo holding bulkhead and 8mm steel splinter bulkhead. The outer void tank was used to store fuel oil but was to be emptied under battle conditions. 1944: Zuikaku added 2x3 25mm guns, 20 single 25mm guns, and 6x28 rocket launchers and had her gasoline bunkers reinforced with concrete. 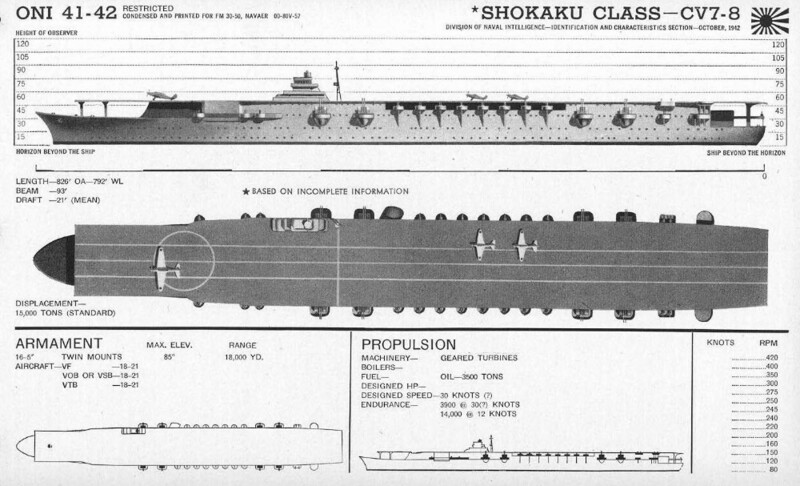 The Shokakus were completed in 1941 and were barely shaken down in time to join the Pearl Harbor Attack Force. They were designed in 1936-1937, free from the restrictions of the naval disarmament treaties, and they were excellent ships, with the largest air groups of any of the carriers with which Japan started the war. Though based on the Soryu, they were much better protected and were completed with a much more substantial antiaircraft battery. Their machinery was the most powerful ever installed on a Japanese warship. Their availability may have been the tipping factor in the decision to mount the Pearl Harbor attack. Their chief weaknesses were an enclosed but flimsy double hangar deck and inadequate fuel bunkerage, but this was not obvious until after war broke out. Veteran pilots also complained of poor habitability, with the living quarters lacking any kind of temperature control. The island was placed amidships to reduce interference with long takeoff runs. The original design called for the island to be on the port side, opposite the exhaust trunks. However, based on landing tests carried out on Akagi, the island was moved to the starboard side after construction had already begun, forcing a reduction in the hangar area and addition of 100 tons of ballast on the port side. 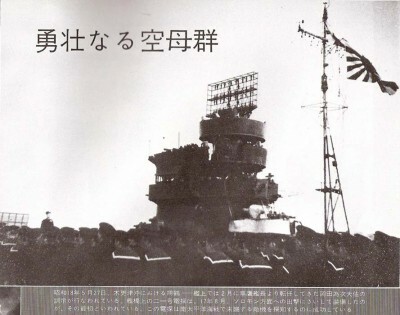 The island itself was closely modeled on that of the Hiryu, and proved too cramped for the larger Shokakus, forcing aircrew briefings to take place on the flight deck rather than in the air operations center on the second deck of the island. The magazine protection was designed against 800 kg (1760 lb) bombs or 8" shells while the machinery protection was designed against 250kg (550 lb) bombs or 6" shells. In addition to their heavy overhead armor protection, the fuel stores were surrounded by voids filled with carbon dioxide. The hangar sides were left deliberately flimsy so that any hangar explosion would vent to the sides without destroying the ship. 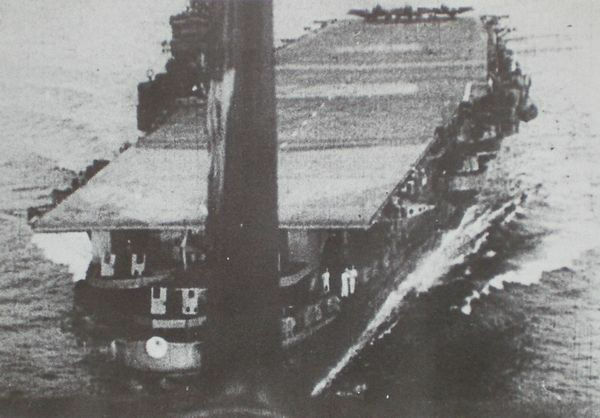 The Japanese hoped this would allow the flight deck to remain mostly intact after a bomb hit, but this assumed that enemy bombs would explode on impact with the hangar deck. The Americans typically fused their bombs to explode immediately after penetrating the flight deck, which was highly effective at tearing up the flight deck. The underwater protection was calculated to be 53% effective against a 450kg (990 lb) charge of TNT but the conclusion from later experiments was that this was too optimistic. The hangar deck was also the strength deck, and the flight deck was made as light as possible, with eight sets of expansion joints to accommodate hogging and sagging. The flight deck had recesses and other provisions for two catapults, but the Japanese never completed development of an operational catapult design and none were ever installed on Japanese carriers. The flight deck was equipped with ten electromagnetically-braked arrestor wires, three crash barriers, and a wind screen. There were two hangar decks, as with most large Japanese carrier designs, The three lifts could be raised from the lower hanger to the flight deck in 15 seconds, and the forward lift was large enough to allow aircraft that had just landed to be struck below with their wings still unfolded, in order to speed landing operations. 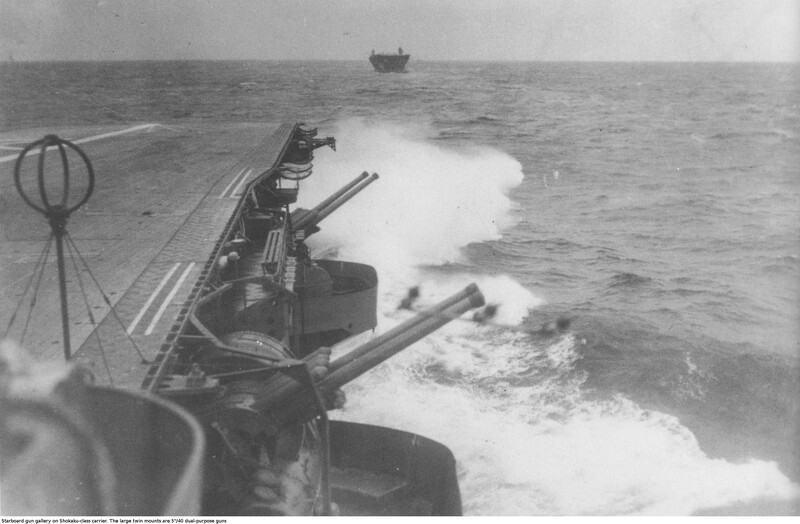 The ship's battery was entirely dedicated to antiaircraft, with little concern for dual use against surface targets. The ships were originally equipped with three Type 94 directors around the island, but one of these was eventually moved to the port side of the flight deck to make room for Type 21 radar. The high-power machinery was built around turbines with high-pressure, intermediate-pressure, and low-pressure sections plus cruise turbines. The cruise turbines were designed for the rather high speed of 26 knots. The machinery seems to have posed some manufacturing difficulty, forcing back the completion dates of the two ships in spite of the rush to complete them before war broke out. Shokaku was completed on 8 August 1941 and Zuikaku on 25 September 1941, giving the latter just over two months to work up before participating in the Pearl Harbor attack. The air group was set at 18 A6M "Zero" fighters, 27 D3A "Val" dive bombers, and 27 B5N "Kate" torpedo bombers. As was common Japanese practice, the air group included twelve reserve aircraft: two "Zeros" and five each of the "Vals" and "Kates". These were shipped partially assembled. 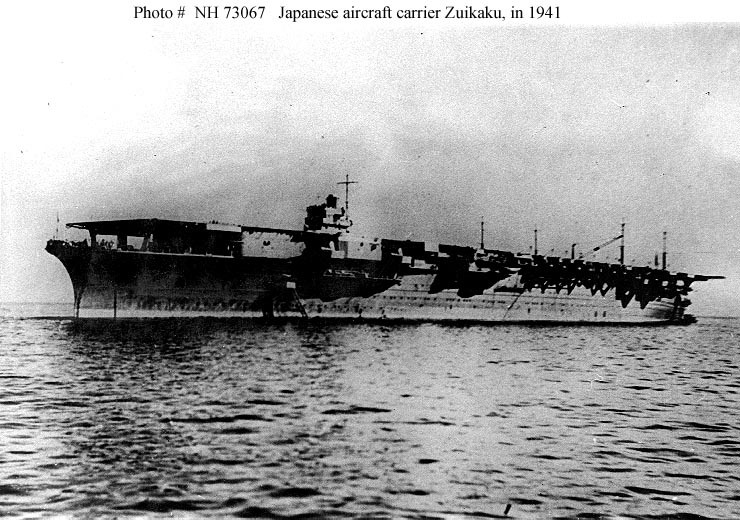 The Shokakus were arguably the most successful warships in the history of the Japanese Navy. They were certainly a considerable thorn in the side of the U.S. Navy after Midway. It is alleged that Nimitz referred to them as "those two ships" with the same acerbity that Robert E. Lee referred to the Union armies as "those people." 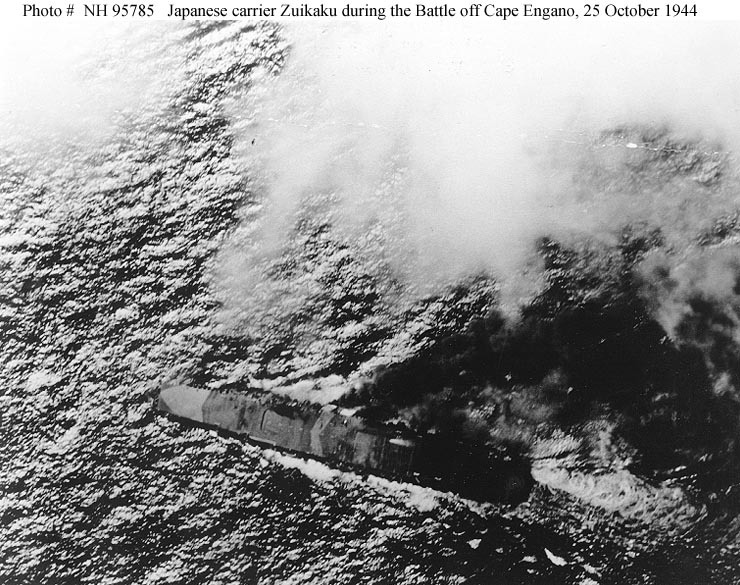 Shokaku was bombed on several occasions but survived, only to succumb to a spread of submarine torpedoes during the Battle of the Philippine Sea in 1944. Zuikaku played the role of sacrificial decoy in the Battle of Leyte Gulf, at a time when the Japanese Navy had few remaining aircrew worthy of her.